Reliance Jio is already leading the Indian feature phone market with its aggressive JioPhone offering. The telco launched the JioPhone last year and marketed it as effectively free for all users, despite collecting a security deposit of Rs 1,500. This year in July, Jio introduced the JioPhone 2 priced at Rs 2,999. And to boost the sales of original JioPhone, the company came up with JioPhone Monsoon Hungama Offer, under which it’s providing the feature phone for just Rs 501. In return, customers have to exchange their existing and working 2G feature phone. 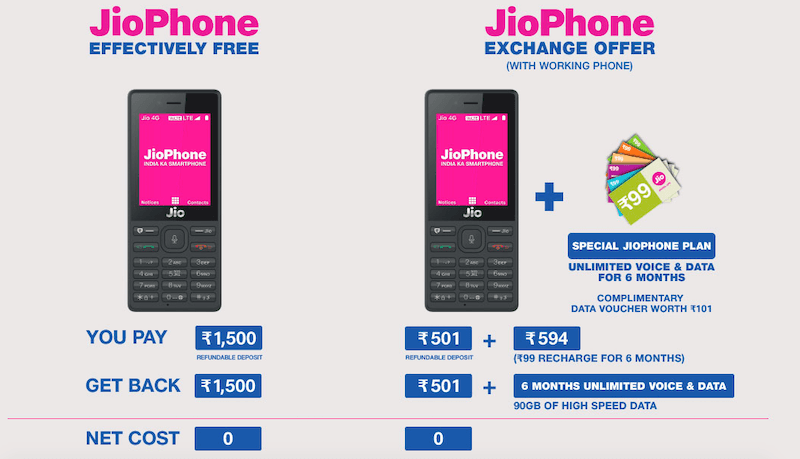 While Jio says you can get the JioPhone 4G feature phone at just Rs 501, you’ll actually have to shell out additional Rs 594 for six months of recharge. Overall, you’ve to pay Rs 1,095 for the original JioPhone with six months of free tariff subscription. Here are the five things you should know about JioPhone Monsoon offer. Yes, under the JioPhone Monsoon Hungama offer, a user can avail the JioPhone by paying just Rs 501. However, customers have to submit any of their working feature phones to avail the JioPhone at Rs 501. For the unaware, the Reliance JioPhone is available for purchase at Rs 1,500 and Jio will be refunding the amount after three years. To recall, Jio kickstarted the Monsoon Hungama Offer on July 20, 2018, exactly at 5:01 PM to make a collision with the price. As of now, there’s no timeline on when Jio is going to end the Monsoon Hungama offer, so you can head over to any Jio store and grab the offer at the earliest. There has been a lot of confusion amongst users regarding which feature phone will Jio offer them after exchanging their existing feature phone. Jio will be providing the user with the first generation JioPhone and not the newly launched JioPhone 2. The Reliance JioPhone 2 is currently available for purchase via flash sales in the country. JioPhone 2 is priced at Rs 2,999 which is double the price of the original JioPhone, and the company did not even introduce any offers as well. After exchanging the feature phone for the new JioPhone, users can either choose the Rs 49 or Rs 153 JioPhone recharge plan to enjoy the 4G services on Jio network. The Rs 49 plan is the most affordable plan right now as it gives a user 1GB of 4G data and unlimited voice calling for 28 days. The Rs 153 tariff plan, on the other hand, offers 1.5GB data benefit per day, unlimited voice and 100 SMS per day for 28 days. As mentioned above, users will have to pay Rs 1,095 at the time of availing the Monsoon Hungama offer, and in return, the telco will give six months of free subscription. Back when Jio announced the Monsoon Hungama offer, it just revealed that WhatsApp, YouTube and Facebook will be available for the two phones- JioPhone and JioPhone 2. But now, the applications have been made available for both the phones and users can head over to KaiOS Store to download them. I think the condition was to recharge 153 plan 12 times a year for 3 years to get the refund of 1500 back. Why waste money when it’s feature phone? After using Jio phone i know the quality is so bad I don’t think it will last 3 years.